Both Bella and CR paid a visit to the nesting tray the other day. Plenty of interaction and noise as well! A snapshot from camera 3 and you can clearly see this is CR. CR (aka Christopher Robin) has been seen around Tewkesbury Abbey since the winter of 2010-11 and was one of 4 chicks hatched at a site in Cheltenham in 2010. In total, his parents have successfully reared 29 offspring, making them probably the most prolific breeding pair in the country. Bella is unringed, and arrived on the scene in 2015. ...unfortunately, they are all too elusive. The camera on the nesting tray has seen nothing but a few pigeons (and a pied wagtail), but sadly no peregrines. 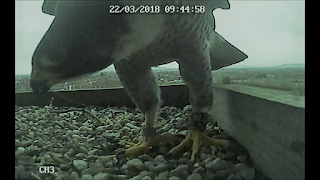 I did see one bird (I think the female) eating its prey on the tower a few days ago, and there are a few feathers blowing around the churchyard, but it looks like there will not be any breeding this year.